The ClearWater II Cartridge Filter and Pump Standard System provides homeowners with everything needed to get their system up and running. It assures them of matched components and optimal performance for years of dependable service. 1. 3-PIECE TELEPOLE. EXCEPTIONAL QUALITY AND FUNCTIONALITY! Enjoy years of use from this professional quality telepole featuring an external cam constructed of high-quality anodized aluminum - no rust or corrosion! This 3-piece telescoping pool has an extra-thick hand grip and two external locking cams for easy operation. The telepole length can be adjusted between 5' and 15'. 2. PREMIUM ALUMINUM LEAF SKIMMER. BUILT TO LAST! 3. DELUXE CHROME THERMOMETER. KEEP YOUR EYE ON THE TEMPERATURE! 4. 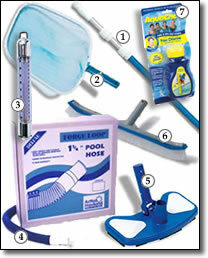 STANDARD VAC HOSE - FOR ABOVE-GROUND POOLS. TOP QUALITY AT A GREAT PRICE! This high quality 1-1/4" vac hose features rugged construction for use on an above-ground pool. Its smooth inside walls allow for full, unrestricted flow and a special U.V. coating provides protection from the sun for years of use. Backed by a 2-Year Warranty. 5. VINYL LINER VACUUM HEAD EXCEPTIONAL CLEANING POWER! 6. NYLON WALL BRUSH. KEEP YOUR POOL WALLS FREE OF ALGAE AND GRIME! 7. AQUACHEK TEST STRIPS. THE QUICK, EASY WAY TO TEST POOL WATER!